It is hard to believe that it is inching closer to December already. It seems like just yesterday I had a lush veggie patch full of produce. Now all I have left is naked brussels sprout stalks, some flat broccoli and an empty cold frame. Kind of a bummer actually but with my second year of vegetable gardening ahead of me, things should be even better next year. With the cold spell we had last week I headed out for what maybe my last harvest of 2008 and came up with some brussels sprouts and radishes. The first being I plant to early, brussels sprouts are recommend to be planted late spring/early summer so the sprouts start to develop in September not August. The second problem was they kept falling over due to their size & weight. Next season I am going to stake at planting time to keep ahead of their growth. The third thing working against me was they received to much shade in the fall once the sun angle lowered. I will plant them in the lower beds next year as it receives much more sun. Finally I am going to plant an F1 variety next year that yields better and grows shorter. I am either going to grow Bubbles or Jade Cross E as they are supposed to be the best varieties. Now for the broccoli, I thought they were done for. When I uncovered them today they seem to be pretty unharmed. The heads still look okay and what looked like leaf damaged during the cold snap now looks fine. They certainly are a little flat from the snow covering, asides from that they seem to be in good order. I will leave them in, still hopeful an act of god will happen and I will be harvesting 2lb heads of broccoli. Next year I will be following the Ministry of Agriculture's recommended planting date of July 15th for late broccoli, not my planting date of August 5th. Lastly about the cold frame. During the day the temperature inside is going higher then the outside temperature even on cloudy days. At night though it is matching the outside temperature pretty closely. The soil is nice and loose inside with the outside soil being frozen about an inch down. This week is suppose to be above freezing so I am going to go ahead and plant some seed. If they grow great, if not I will try again in March when the season gets a little less nasty. Every since we moved to our current home I have thought our tiny front lawn would be a great candidate for naturalizing bulbs. After a few years of procrastination as well as a good amount of indecisiveness I finally decided on Muscari. They are a very early bloomer, they are a small plant and should disappear the fastest in the spring making way for the lawnmower. 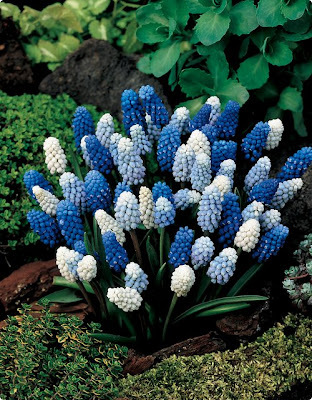 I picked up about one hundred Muscari 'Magic Carpet Mix' bulbs from veseys and purchased them at 50% off because it is the end of the season. I guess most folks don't like to be out digging in the snow. My first step was to plan ahead, this is a concept I am just starting to master. In the spring we want to expanded the front perennial border a bit, changing the shape from a straight line to a curve. We also want to put in a stone path for access to the side yard. So I laid down string in the shape of the new layout and spray painted lines into the lawn. Now I won't be digging up the bulbs next spring. I then took a narrow trowel and cut 3 inch plugs out of the lawn that are about 3 inches deep. The plugs were spaced about 6 inches in all directions. Once I dug all one hundred holes I then placed a bulb in each one and tamped the grass plug back in the hole. Now I have to play the waiting game until spring and hope the squirrels behave. I will update in March/April when they are blooming. 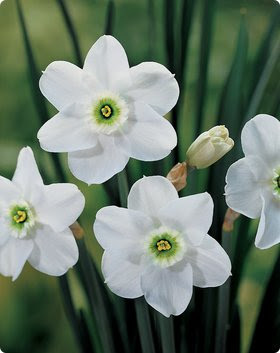 Well ordering the muscari for the front lawn I also picked up some daffodils. I have a good variety of daf's around the yard and I have also under planted the 70 or so feet of hedge with them. I prefer planting them over other spring bulbs because they are basically care free and the squirrels don't bother with them. This year I added the following varieties. Daffodils should be planted 4-6 inches apart to allow for future bulb development and 3 times their depth deep or about 8 inches. They do best in full sun but I have also grown them in pretty shady condition but blooms numbers will be hampered. Planting times for daffodils is anytime in the fall when the ground can be worked. The only other thing to consider with daf's is they get pretty ugly when the blooms are finished and the leaves have to be left alone until they yellow and die back. 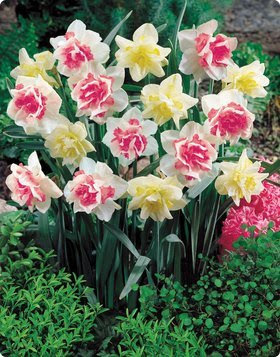 I just live with the ugliness but some suggest planting daffodils with peonies or daylillies so the foliage is masked within the developing plants. Well, it has been one mighty cold couple of days. It is not unheard of for my area to have lows of -10c(14f) in November but the last few years makes it certainly seem unusual. Even with the temperatures I decide to put the cold frame out anyway and see what happens. I built the frame about 6 inches higher then is recommend so I could bury it into the soil for added insulation. I dug the hole, placed it in and then back filled around the outside. I then raked out the soil inside, put the cheapo thermometer in and shut the lid. After about an hour I headed back out and the temperature was holding at 0c(32f) with the outside temperature being -5c(23f). I then checked again just before sunset and it was holding at -2c(29f) with the outside temperature being -7c(19.5f). I will be checking again later this evening and early tomorrow morning. This is obviously nowhere near a consensus of the temperature range of the frame but I am pretty sure I will not be starting seeds anytime soon. If the outside temperatures stays in the range they have been I will not be starting any seeds until march I'm guessing. Now if we go back to the temperature we have been having the last couple weeks I may be able to start some baby greens. Only time will tell I guess. Either way if I can not use it right way it will most definitely come in handy in March when the sun and temps are stronger. On another note I have started to read two of Eliot Coleman's books, 'The New Organic Grower' as well as 'Four-Season harvest.' He runs a four season farm in Maine, US and has mastered the technique of four season growing in a climate that is harsher then mine. What I can gather from glancing over the books is he plants from Aug-Oct for winter harvest and then basically holds over the crops in the cold frame or in his case movable greenhouses. So in other words I should have built the cold frame in Sept and seeded no later then Oct. I will keep updating on the frame as things progress as well as do a post on how I built the frame next week. I also have some fall bulb posts in draft that I will be posting over the next few days. I was out Sunday afternoon to wrap up my broccoli in row cover. For the next 5 days the highest day time temp is supposed to be 2c(36f ) and the coldest night temp is supposed to be -9c(16f) with light snow most days. Thankfully the snow just sticks overnight and melts by the afternoon. This will not be the case soon, from the middle of December on we are usually under snow 90% of the time until the spring. The broccoli heads are a little bigger then a golf ball right now. I am not holding much hope for them but who knows it could always warm up some time next week. Am I being overly optimistic? The brussels sprouts are ready to start being harvested on the lower portion of the stem. They develop in succession up the stem. They have held up pretty well to the cold but I'm not sure if the higher sprouts will develop any larger. Taken at 7am, this melted by 10am. The beets are not going to produce, I planted them way to late. I have picked some of the greens though so it is not a total loss. The radishes also don't seem to like the snow. They are looking decidedly wilted. We have eaten a few of them but the slugs have been doing more grazing then I have. The garlic I just planted about a month ago has almost all sprouted except for about 3. I am very surprised to see that they sprouted already in the cold. I read some more about growing garlic and it is not uncommon for them to sprout before spring and it should be fine. I'm glade I planted them deep because if the sprouts are damaged by the cold they should still be fine below the soil. I came across this bat hanging on the foundation. It kind of freaked me out because I found it well I was putting the row cover on and was face to face with the beast. It was barely alive from the cold and I imagine was on the foundation because it is south facing. It did fly away because it was gone the next morning. We have loads of bats in the yard and I often watch them catching bugs at dusk. We have even had one in the house once, I'm not going to get into that story but lets just say I didn't handle it well. Lastly, I finished the cold frame and will post about it near the need of the week once I get it all set up. Today I am posting garden bloggers bloom day which is one day late. It is supposed to be done on the 15th of each month and is hosted by May Dreams Garden . Early next week I will do a veggie garden update and I will follow with my cold frame plans by the middle of next week. I am very late getting the cold frame done, it should have been started the first week of October. See a pattern here, I'm not good at doing things in a timely manner! Being in zone 5, during November, there is really not much to find that is in bloom. I did manage to come across a few blooms as well as some blooms that have gone to seed. I think the seed heads are just as nice in some cases as the flower itself. I will also include a few foliage shots. produced a lone tiny bloom that is about 2". the frost hit it which has been the most it has ever bloomed. can tell it is on its last life. Hakone - I love this grass and it grows in the shade too. This recipe came into our main e-mail address the other day, they looked really good so I made them. It is a great fall cookie that is easy to make and produces a cookie that is crispy on the outside and chewy on the inside. I will be making these again very soon as they did not last long. The recipe can be found on my Mom's baking blog, Canadian Baker Too. You should also check out the Reeses Squares that my Mom made, they were amazing. I picked up the rest of the supplies I needed to build the cold frame. It sure seems like a lot of wood, I did calculated the amount I needed in order to not waste much. Lets hope I figured right and I cut the appropriate piece on the appropriate piece of lumber in order to have the right amount. Boy that is a loaded sentence. So far I have completed building the frame around the window. I wanted to finish more this Sunday afternoon but the drizzle turned to rain and the caffeine levels were getting low. I am planning on having it finished by next weekend and then I will be about to plant in it a few days after that once it warms up inside. I also remembered that I have a heater cable amongst my junk. I used it the first winter that we moved to this home to keep the pipes from freeze in the upstairs eves. I have since insulated the area so I can make use of the heater cable in the soil of the cold frame. With the cable I should be about to grow year round. A few days ago I visited Stephanie Falls in Ancaster, Ontario. I first saw it on the Hamilton: City of Water Falls group on Flickr. It took two trips to find because it is not public property so there for there are no trail markings. The first visit we were way off where it was and the second visit we managed to find the right spot after further discussion with a fella on Flickr. On the first trip we came across two ladies one looked to be in her 60's and the second looked to be in her 40's. We used their map to see if we could find the falls we were looking for but it was not much help. Then they told use that they have been hiking for four hours and this is not a flat trail. You are hiking up 70 feet or more and then back down and it just continues like this. It was getting close to dusk and I figured they were lost. We kept an eye on them and when they came out by our truck they realized they had no idea where they were. I got out my map to see how far their car was and then we drove them back to their car. If they had to walk back, it would have taken them at least 1.5 hours to walk back by the road. It was a good thing we found the wrong trail that day or they would have been lost in the woods in the dark. The last couple days we have been having some warm days. It is actually kind of funny how two months ago it would be a bad day if the temp was 18c(65F) and now its like a beach day. I have been taking advantage of the nice days either biking or going waterfalling. On my last ride I went on I came across a honey bee hive in a tree along the bike trail. At first I thought it was a coat hanging in the tree but as I came closure it certainly was a honey bee hive. It seemed kind of strange to me that they built a hive on a branch right in the open. I was always under the impression that they built hives inside trees, in the ground or in structures. I guess you learn something new every day. Either way it was exciting to see a honey bee hive after there being such a problem the last few season with colony collapse disorder. We have been receiving numerous thick frosts the last few weeks. I like photographing frost so I have been out a couple times to photograph it. The best time to photograph frost is in the middle of winter like in the photo below which was taken in winter 2005. If we receive a few warm days which creates fog followed by a fast cool down the fog will freeze over night and creates hoar frost. Hoar frost most often occurs near bodies of water. frost I had ever seen. This was taken beside the Grand River. The photo's below are of the broccoli and brussel sprouts, they have been recently taken. The brassica's don't seem to be bothered even by the hardest frost. I think I will put the row cover permanently over the broccoli if we get a prolonged cool down but so far it has been fine left out in the open. The broccoli is just starting to form flower heads so fingers crossed it stays just warm enough for them to produce. The brussel sprouts are starting to fatten up so I am hoping I can harvest them by the first couple weeks of December. They may be under 6 inches of snow by then but I have heard they can take snow. I have put a post on garden web about how to get the sprouts to grow faster and evenly. I was told that you should top the brussel sprout plants 4-6 weeks before you want to harvest. I am going to give this a try because the sprouts that are closer to the top are only the size of marbles.